There are a lot of rules in life, especially when it involves human safety. It is important to take some time to consider any rules, laws, regulations, or restrictions when it comes to making DIY (do-it-yourself) auto repairs at home. Consider your safety and the safety of others around you, and you will usually be okay. However, there are many other types of rules that you might be subject to that could impede your ability to work on your car at home. Make sure to visit LaCava Auto Parts and Auto Supply in Fall River for everything you need to safely repair and maintain your vehicle in Southeastern Massachusetts and Rhode Island. Are You Allowed to Make Repairs? The first question you need to ask yourself before you spend money on tools, fluids and auto parts in Fall River, MA is whether you are allowed to make repairs on your property. Do you own your own home? Are you a renter? Do you live in an apartment complex, condominium property, or a Home Owners Association (HOA) where the rules might prohibit on-site repairs? Make sure to speak with whoever is in-charge to find out if you can do it on your own or if you will have to see a pro even for basic Fall River auto parts and services. 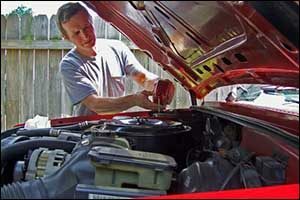 You might also want to check local laws regarding car repairs and proper disposal of fluids and old parts. Some rules are more about common sense. Such as, not smoking while doing car maintenance and repair. There are a lot of flammable fluids, so it’s just not safe. Another is not working on a vehicle unless the parking brake is engaged, the car is set to Park or Neutral, and that the engine is shut off. Allow parts and components to cool down after operation or testing to ensure that you don’t get burned. While these may seem like “no-brainer” tips, you might be surprised at how many times people overlook these safety tips and get hurt. Take some time to learn about how to properly jack up a vehicle to do work on it. Your owner’s manual should have instructions on the best positions to place the jacks to prevent damage to the frame. You can also find information online for the best types of jacks for home repairs – hint: it’s not the jack that came with your car. Stop by our auto supply services in Fall River to take a look at our selection of jacks and get insider tips from our pros. If we don’t have what you need in stock, LaCava Auto Parts can always order it for you and even deliver it in the Greater Fall River area. It is important to have a quality set of tools if you are going to be doing work on your car or truck. Our store carries a wide variety of tools and other auto supply in Fall River. Make sure to use insulated tools if you are doing electrical work. Before you use a wrench or a ratchet on a stuck part, make sure you won’t hit yourself or another component of your vehicle when it comes loose. If you require special tools or aren’t sure what you need to remove a specific part, contact LaCava Auto Parts. We can help with a wide variety of Fall River auto parts and services that we keep in-stock, and even order you specific tools for your project. Another area that is extremely important is the storage and disposal of toxic chemicals. Even auto body cleaners and detailing fluids fall into this category. Coolant, engine oil, lubricants, and other fluids all have detailed safety instructions on the bottle. It is in your best interest to pay attention to recommended use, storage, handling, and things like safe zones for temperatures in summer and winter months. Wash your hands thoroughly after handling or using and make sure your storage area is up and away from access to children and pets. Find out local laws and regulations regarding disposal of old engine oil and oil filters, anti-freeze, and other essential auto maintenance chemicals. If you need parts, tools, or accessories for your ongoing vehicle repairs and maintenance, make sure to stop by our Fall River auto parts and services store at 1262 Bedford Street. 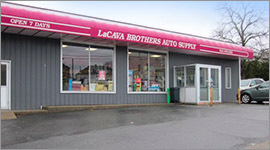 LaCava Auto Parts and Auto Supply in Fall River has been providing quality sales and service to customers and professional clients in Southeastern Massachusetts and Rhode Island region for over 70 years. Give us a call at 508-676-1951 to speak with our friendly customer service team or to hear directions and store hours.